Cells can avoid "data breaches" when letting signaling proteins into their nuclei thanks to a quirky biophysical mechanism involving a blur of spaghetti-like proteins, researchers from the Rockefeller University and the Albert Einstein College of Medicine have shown. 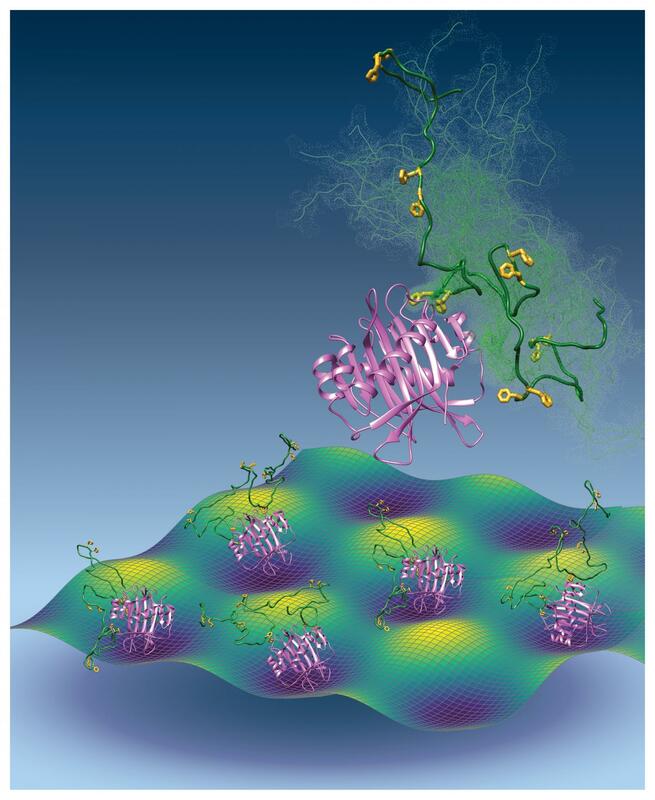 Their study appears in the March 23 issue of the Journal of Biological Chemistry. In every human cell, all of the body's blueprints and instructions are stored in the form of DNA inside the nucleus. Molecules that need to travel in and out of the nucleus – to turn genes on or off or retrieve information – do so through passageways called nuclear pore complexes (NPCs). Traffic through these NPCs must be tightly controlled in order to prevent DNA hijacking by viruses or faulty functioning as in cancer. To travel through NPCs, many molecules must be attached to proteins called transport factors (TFs), which act as shuttles that the NPC recognizes. But the NPC faces a challenge: It must accurately recognize and bind to TFs to let them through without admitting unwanted traffic, but it must let them through quickly — in a matter of milliseconds — in order for the cell to be able to do its duties. Proteins known to accurately bind to specific molecules, like antibodies, normally stay stuck to their targets for periods of up to months. "How on Earth do you have the kind of specificity that we see in protein-protein interactions like antibodies, and yet have the kind of speed that we see with water off a Teflon pan?" asked Michael Rout, professor at Rockefeller University who was one of the co-lead authors of the work. To investigate this paradox, Rout's team — in collaboration with a team led by David Cowburn at Albert Einstein College of Medicine — looked at the material inside the nuclear pore. The aperture is lined with a type of proteins known as intrinsically disordered polypeptides — stretches of amino acids without a discernible, defined shape. "The stuff that fills the NPC is… like spaghetti, very long strands made of kind of wiggly stuff," said Ryo Hayama, the postdoctoral fellow who was one of the co-first authors of the study. The intrinsically disordered polypeptides of the NPC are called phenylalanine-glycine nucleoporins, or FG Nups. The interactions between FG Nups and TFs are key to the nuclear pore's gatekeeping function. But how this interaction works, either in healthy or diseased cells, is not well understood, mainly because of the challenges of studying proteins with intrinsic disorder. "Conventional methods like electron microscopy or crystallography can only give a very literally blurred view, because the proteins themselves are blurry," Rout said. "They are disordered and moving around." Hayama and co-first author Samuel Sparks performed thermodynamic experiments in which they constructed FG Nups of different number of FG repeats and measured how much heat they gave off when mixed with transport factor proteins. These data could be used to calculate how the number of contact points between the transport factor and the NPC affected how strongly and quickly they bound to each other. They found that the key to this interaction being so specific, yet fleeting, was in many quick, transient contacts between transport factors and FG Nups. Similarly to the threads and hooks of Velcro, each amino acid pair of the FG Nup region only attached to the transport factor very weakly, with an overall result of affinity between the two partners; but unlike Velcro, the partners were not stuck together longer than necessary for the transport factor to travel through the nuclear pore. "I can't think of any analogy in normal life that does what this does," Rout said. "You've got this blur of (amino acids) coming on and off (the transport factor) with extraordinary speed." This "fuzzy" interaction is unusual, and possibly an extreme case among protein-protein interactions in cells, Cowburn said. But understanding it is important for controlling access to the nucleus, a key vulnerability in cell function. "In cancers, there can be mutations in the nuclear pore complex and in cell transport factors," Cowburn said. "And, likewise, numerous viruses are known to deliberately target the nuclear pore complex and transport factors and alter them in order to usurp the (cell) for their own ends. Precisely what they're doing and how they're doing it is still not known, because we're still trying to disentangle the normal mechanism."